Way back in the day—like 1983/1984—me and my friends on my block would cram into my bedroom on the hottest days of the summer, in front of a fan, and have serious sessions of the classic arcade game Warlords on the Atari 2600. What made it such a cool game was that it was a four player game using the paddle controllers. 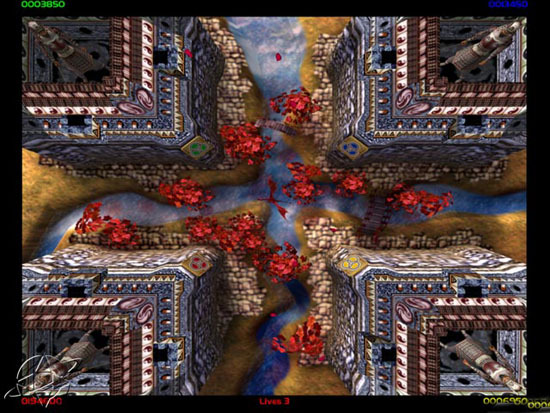 So everyone took a corner fortress of the screen in this multiplayer Breakout-style game, and we’d battle it out, using the bouncing balls to try and destroy our enemies’ walls to cream the kings behind while protecting our own wall from being destroyed so our king wasn’t vulnerable to a ‘pong’ attack. Twenty years later, in the heat of the retro gaming craze, the company Infogrames, responsible for making about a dozen modern remakes of classic 80s video games, took a shot at Warlords for the PC. 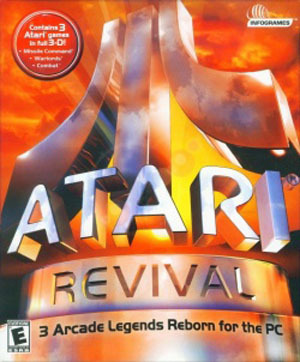 However, instead of selling it on its own, they pulled a money-making scam and packaged it in the “Atari Revival” package with two games that had ALREADY been released individually, Combat and Missile Command. Although I had already owned those two remakes, I HAD to rebuy them just to get Warlords. Well, here it is about seven years later, and I finally took the time to play and complete Warlords remake. And in theory, I loved it. Unlike other major 3D arcade remakes such as Frogger and Centipede, this ‘remake’ is mostly just a visual update with a few new gimmicks in game play. The archaic block graphics on a black background from the original Atari 2600 hundred have been replaced by a very unique concept. Each of the walls in the four corners is represented as a top down view of a colorful and finely detailed castle wall. Inside the wall stands a knight (appearing to be caged in) who is very active, looking around and responding emotively to the action going on around him (or sometimes her) as the walls are bombarded by fireballs. Yes, the old skool Pong ball has been replaced by flame streaking fireballs. These fireballs are released by none other than a dragon that flies around the empty area in the center of the screen. Said dragon releases the fireballs sporadically until players are eventually juggling FOUR fireballs at once. Good thing is, your shields (which truly look like shields) can catch a fireball and hold it until you decide which enemy you want to fling it at. And when you hit the button to catch a fireball, your shield reaches out in the form of a big metallic knight’s hand! Pretty cool. The game mixes things up graphically as you proceed through the levels, because every four levels or so, you are actually placed in a NEW environment! There’s a typical castle/moat environment, snow, even outer space! Hey, if Jason and Leprechaun can go to space, why can’t Warlords? Aside from the traditional practice of moving your left and right to block fireballs and aim them at other players’ walls, there have been some new tricks added to the mix. First, not only does the dragon shoot out the fireballs, but as he flies around during each level, he also releases these floating shields that have symbols on them. If you hit one of these floating shields with a fireball, it usually works to your advantage. Depending on what symbol appears when your fireball makes contact, a variety of things can happen for a short period of time. You can shrink your opponents’ shields, enlarge your own shield, give yourself temporary invincibility, get an automatic wall repair, reverse the directional controls on your opponents’ shields (totally messed up), give everyone invisible walls, or slow down the balls. Of course, none of those tricks is convenient when you’re not the one who hit the floating shield. And a couple of other tricks are not particularly helpful no matter who hits them, such as one that turns all players’ walls invisible, one that turns the fireballs invisible, one that speeds up the fireballs to the point of chaos, and one that SWITCHES your castles for the REMAINDER of the level. In other words, say you’re castle is in the bottom left corner. You may be tossed up into the top right corner. Depending on where you are switched to, the position can actually reverse the direction of your controls, again, totally messing you up, only this time for the remainder of the level (which always ended in me dying). There are also ‘bonus levels’ every four levels or so in which you go one-on-one with the dragon. It’s just your castle and the dragon, who spits his fireballs at you and then just flies around so that you can try to hit him with them. He’ll become smaller (which, based on the top down view, represents him swooping closer to the ground—in essence, INTO the screen) at which point you can’t hit him, but once he’s back to full size, you have a few seconds to nail him. The goal is to hit him a number of times with fireballs to kill him before the bouncing fireballs destroy your castle. Good news is, if you do ‘die’ in the bonus level, you don’t lose a life. In total, there are 40 levels, and then you are treated to a short and sweet movie that ‘ends’ the game. Even though you have a set number of lives (and can earn extra lives through points as the game progresses) there are really no worries about not being able to complete all forty levels. If you get a ‘game over’ because you lost all your lives, the game simply asks if you want to continue, at which point it picks you up on the very level you were last playing. So in essence, you have ‘infinite’ lives. You can also pause and save the game at any time, so you don’t have to play all forty levels in one sitting. I played the game solo, so all other players were computer controlled. The only real competition was the ‘player’ diagonal to me. Since the other two are right next to you, all you really have to do is catch a few fireballs and throw them repeatedly at the same spot in the opponents’ walls, quickly creating an opening to nail the knight within. You don’t have such direct aim at the diagonal opponent, so you have to rely on ricocheting balls to bust through the wall and nail your target. My diagonal opponent beat me one too many times, so I actually began letting the other two opponents live a bit longer so THEY could create a clean opening in the diagonally opponent’s wall from their positions! This entry was posted in Living in the 80s - forever, What I'm Doing With My Joystick and tagged 1980s, 80s, Atari Revival, Infogrames, PC gaming, retro gaming, Stelladaptor, video games, Warlords. Bookmark the permalink.